The true colors of Mars: NOT RED! Since the begining of Mars exploration, most notorious unmanned spacecrafts like the Viking, sent images of the surface of Mars or the planet itself full of marvelous technicolor red. Red skies, red rocks, red ground, red planet. WRONG! With the evolution of technology and our own public curiosity, it is hard not to look closely at the latest images of Mars from the Spirit and Oportunity rovers on the surface of Mars, and perceive a diferent image of the one which is being conveyed to the public. 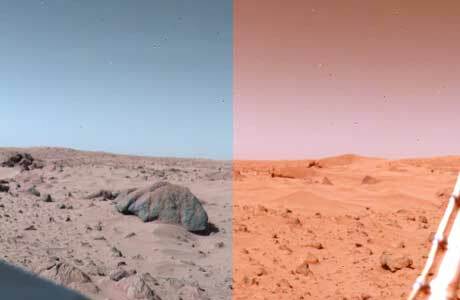 The first color image taken from the surface of Mars (left), snapped by Viking Lander 1 in 1976, shows Earth-like colors and a blue sky. Several hours later, NASA released an updated version (right) that astounded the world with its orange skies and red soil. This vision of a red Mars has influenced nearly every NASA image since and has become entrenched in pop culture through movies such as Total Recall and Red Planet. Some imaging specialists suggest the original colors were closer to the truth. This part of Mars looks surprisingly similar to a rocky stretch of prairie land in Oklahoma. Despite their enormous differences, both planets have oxidized surfaces that have been shaped by wind and (on some parts of Mars, at least) flowing water. So, which is the real one? What is the real color of Mars? RelatedMars robots may have destroyed evidence of life! In "Mars"NASA: Back to the Moon and Mars! This entry was posted on Wednesday, June 24th, 2009 at 4:21 AM and is filed under UFOs. You can follow any responses to this entry through the RSS 2.0 feed. You can leave a response, or trackback from your own site. Why then should the Mars sky, as NASA/JPL PR-department spreads it, should appear red? This coloring is justified if at all, only with the refraction of light at atmospheric dust. But such masses of dust in the atmosphere do not prevail over years on a planet, which has large water-clouds, fog and ground frost, since water would wash these away after short time. Astronomers at the Hubble Spacetelescope and amateur-astronomers are observing, since long time now, white water-clouds and blueish atmosphere. Indeed, when the first color picture from Viking 1 was received on Earth, the Mars soil was red-brown and the sky was blue, a landscape comparable with the desert of Arizona (fig. A and B). These are original pictures of the two probes, which are only slightly color corrected to match the filter response values of the camera system. However, the original data without correction, you see on the right of each image, has almost no detectable difference in color. The Viking cameras operated according to the principle of a color scanner, whereby for different light wave lengths different sensors with separate data channels are used. To create a colorful picture from this scanner data, a color calibration table is necessary. These tables can be seen near the mast of the parabolic antenna in Pic. A and B and show among grayscales the three basic colours (RGB) of a color monitor. Already with the naked eye it can be detected there that the colours are correctly shown. Also in Pic.E this can be acknowledged, since the white ground frost (water ice!) supplies a natural color calibration to the white alignment. Pic.C shows a typical (NASA-)red Mars picture in the color, taken 18 months later. How does it come to this color change, although the sharply bordered shadows and the otherwise clear colours suggest no atmosphere dust? The solution of the mystery appears, when using an image processing program: By rising the color-values of blue and green about 50% and 25% one gets to Pic.D, which shows the well known true coloring from Pic.A and B.